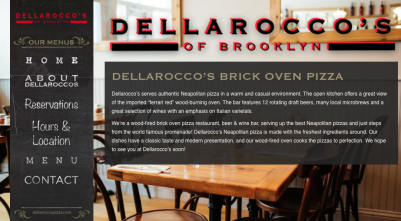 Design Burd Inc.Dellarocco’s Brick Oven Pizza | Design Burd Inc.
Dellaroccoâ€™s serves authentic Neapolitan pizza in a warm and casual environment. The open kitchen offers a great view of the imported â€œferrari redâ€ wood-burning oven. The bar features 12 rotating draft beers, many local microbrews and a great selection of wines with an emphasis on Italian varietals.